Gemalto, the world leader in digital security, released the first-ever Facebook SIM card. The SIM chip has the feature of making every GSM phone a Facebook phone even your old fashioned handset, rolling in almost all the features of the social network. The SIM has been developed with the help of Facebook but don’t expect features like picture streams or sliding interfaces, it rather delivers minimal features. With the help of the SIM, users would get text-menu-based integration including status updates, pokes and friend requests, porting it on any GSM compatible handset. We worked closely with Gemalto on their Facebook for SIM product and believe it will be another easy and affordable way for people to stay connected through Facebook on the mobile phone of their choice. Facebook for SIM creatively combines technologies from some of our existing mobile solutions that especially are attractive for people with feature phones and have limited or no data plans with a mobile operator. Through the Facebook application on the SIM card people can: Update their status and view comments on it; write on their friends wall; receive notifications; find friends on their SIM phonebook. 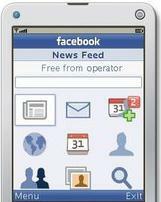 Facebook to Hold Special Mobile Event- Could this be the Facebook Phone?